by Thomas Hardy Author · Kristin Brady Author of introduction, etc. "See if she is dark or fair, and if you can, notice if her hands be white; if not, see if they look as though she had ever done housework, or are milker's hands like mine." So Rhoda Brook, the abandoned mistress of Farmer Lodge, is jealous to discover details of his new bride in 'The Withered Arm', the title story in this selection of Hardy's finest short stories. 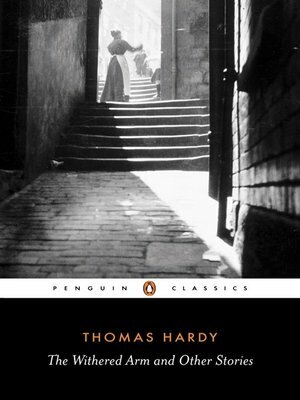 Hardy's first story, 'Destiny and a Blue Cloak' was written fresh from the success of Far From the Madding Crowd. Beautiful in their own right, these stories are also testing-grounds for the novels in their controversial sexual politics, their refusal of romance structures, and their elegiac pursuit of past, lost loves. Several of the stories in The Withered Arm were collected to form the famous volume, Wessex Tales (1888), the first time Hardy denoted 'Wessex' to describe his fictional world. The Withered Arm is the first of a new two-volume selection of Hardy's short stories, edited with an introduction and notes by Kristin Brady.